Sawel is seated in the heart of Northern Ireland’s Sperrin Mountains. The summit reaches a height of 678 meters and forms the highest point in the Sperrins as well as counties Derry and Tyrone. I walked up in 40 minutes, and down in about 30. The walk requires little navigation as it follows a fence for all but the last 100 meters and can be easily extended to take in the summit of nearby Dart. I’ve been curious about the Sperrins ever since a primary school maths teacher, Mister Murray, explained to the class his love for his native Sperrins. On cold days as he presided over 30 boys excited by flurries of snow outside the window he would gaze into the distance and tell us there were reports of deep snow on the hills at home. What was so special about this place that my teacher seemed to miss so much? It’s a fair distance from where I live to the Sperrins though with the opening of the M3 it is now a shorter drive than it was a few weeks ago – so I made an early start and took breakfast with me to enjoy among the Beaghmore stone circles, near Cookstown. As with other ancient sites I’ve seen during the course of this island hop I was amazed to be eating my muesli beside lichen covered rocks that were put in place up to four thousand years ago. I imagined those ancient people congratulating themselves as they lowered the very stone I was leaning against into the ground, perhaps having a snack and a drink before returning home. I had the place to myself for most of my visit and enjoyed wandering around the circles and imagining how they might have fit into the local culture before being forgotten and swallowed up by the developing bog. The circles were uncovered quite by chance during the 1940’s by local farmers as they cut turf. Most intriguing is the fact that the entire area has not been recovered from the surrounding bog yet…perhaps there are more secrets buried beneath. 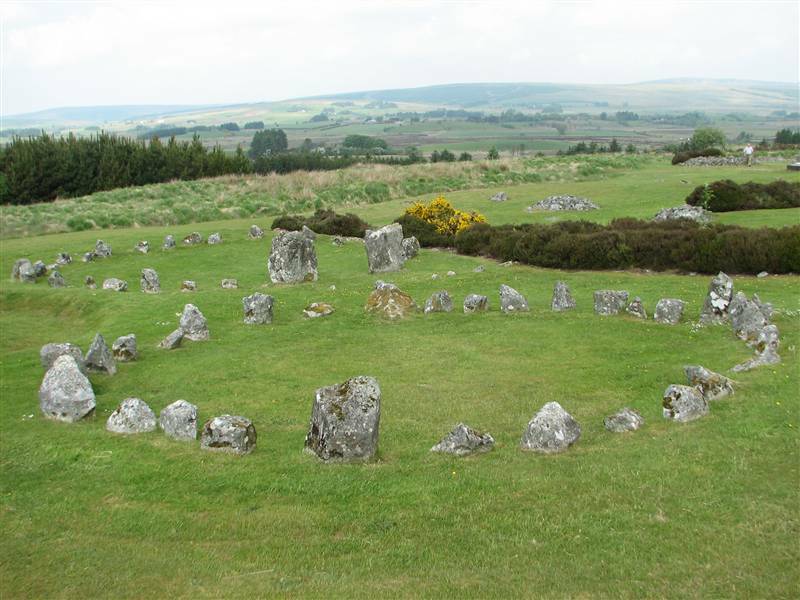 Beaghmore Stone Circles - 4000 years of history, freely accessible. Almost as good as the Stone Circles was the drive to my start point for Sawel near the hamlet of Sperrin. I didn’t pass another car for miles as the tiny road twisted up and down through the hills with views that showed no buildings or power lines, just hills rolling off into the distance and white butterflies flitting around the car whenever I stopped to take a picture. Soon enough I descended into the Hamlet of Sperrin, nodded to the farmer working on his tractor and continued on to the Sperrin Road which climbs up between Sawel and Meenard Mountain. After passing a second cattle grid I parked at the side of the road and stuck on my boots. That’s the difficult navigation done for the day as you can follow a fence for all but the last-minute or so of the walk. Don’t believe me? The Google Street View below will show you the parking spot, the fence and what a sunny day in the Sperrins looks like. The going is steep to start and pretty soggy underfoot but it does ease off before getting steeper again towards the top. Once at the top you’ll find a trig point and great views of the surrounding area, including a sliver of Lough Foyle. 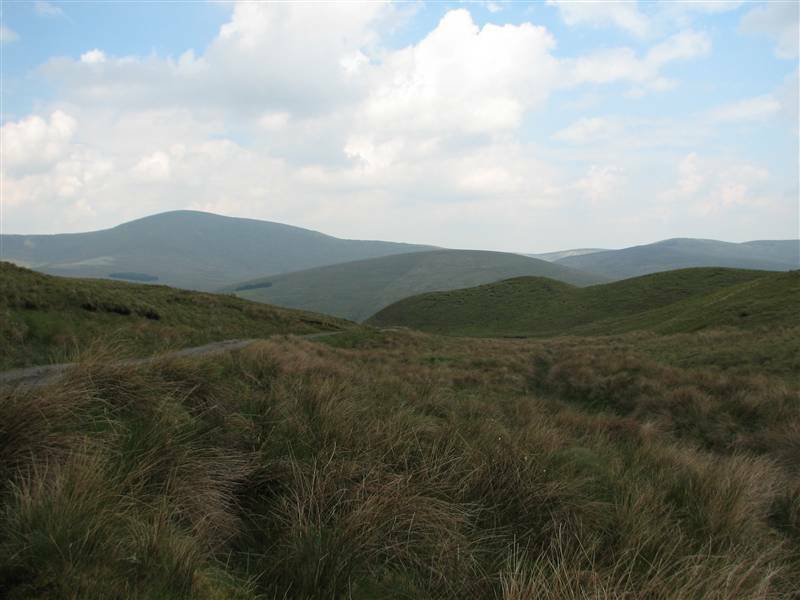 You can also continue on to take in Dart which is close by, though I chose to hop the fence to the south of the summit to take in the highest point in Tyrone – which is unmarked. The fence is a great friend as you make your way up and down the hill, though its presence at the top does take away from the wildness of the location, which would be great as there is not a great deal of human activity on view. On that note, both the Beaghmore Circles and the Sperrins themselves feature as star attractions in a book I have previously mentioned called Britain and Ireland’s Best Wild Places. The author has good taste. I ate my lunch before making the half hour descent to the car for my drive home through the wonderful Glenelly Valley. Unfortunately the distraction of the views meant that I missed the turn for the Creagán Visitor Center which I had planned to visit. Still, the drive south through the back roads towards Omagh and Enniskillen before carrying on to Cavan showed the Irish countryside at its summer best. With the fine weather I was tempted to tackle Cuilcagh which stands impressively outside Enniskillen, but decided to do it properly another time. The Beaghmore site is sign-posted from the A505 from Cookstown. The location and route to the parking location for Sawel is indicated in this map. The site itself is freely accessible at all times and is just one of 742 noted monuments in the area. Here’s a piece from The Telegraph on walking in the Sperrins hills. 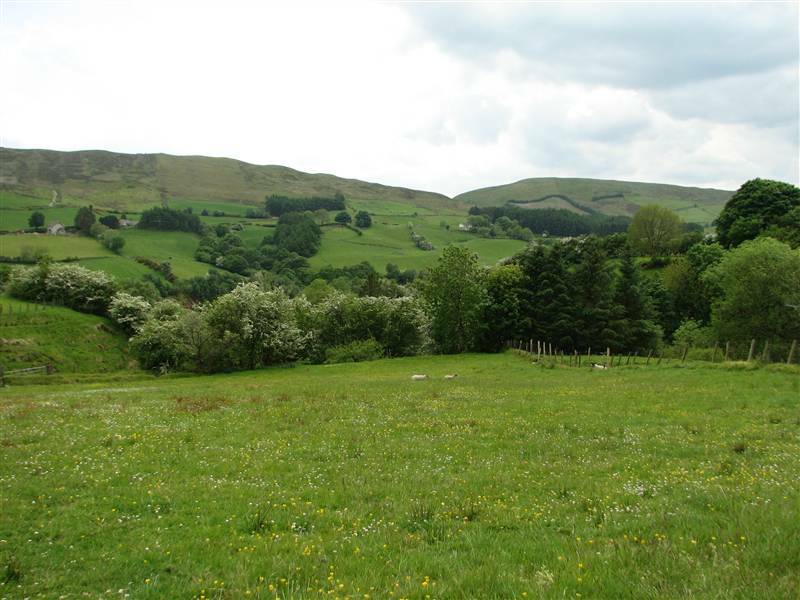 You’ll find lots more information about the area on the Sperrins Tourism website. 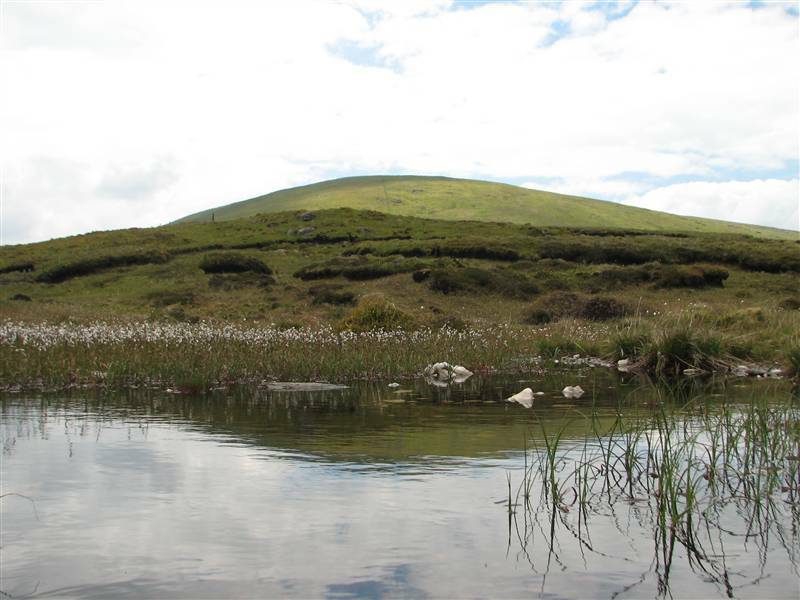 Enjoyed reading re: Sperrrin highest peak. My relatives live in Creggan Center/Carrickmore/A505, a short walk to A505. How far is the peak from there, miles /meters, and time-wise? Also I usually visit during March/April, what months would be safe to trek this area? Should I do the beginning of hike in wellies and then put on my walking boots? , I am not in the best shap but can and do walk on a regular basis. Could I still hack it? I live in portsmouth, Rhode Island,USA, about 1.2/5 hours SW of Boston, 7 miles N of Newport and 17 miles S of Providecne,R.I. Without knowing for sure where your relatives live, I reckon they are about 40 minutes drive from the parking point I used for Sawel. You can walk the hills of Ireland at any time of year, provided you have appropriate clothing, maps, experience and fitness. The weather in March/April can be quite changeable, and snow showers would not be uncommon on high ground. As you can see from the Streetview image at the bottom of my post, Sawel is located in a pretty remote area, so I wouldn’t recommend you go up there without knowledgeable company, unless you are confident of your capabilities in the hills. The ground is untracked and reasonably steep in places, so fitness wise, you’d need to be happy ascending and descending a steep slope for an hour in each direction. If you are visiting soon I hope you have a great trip to Ireland.